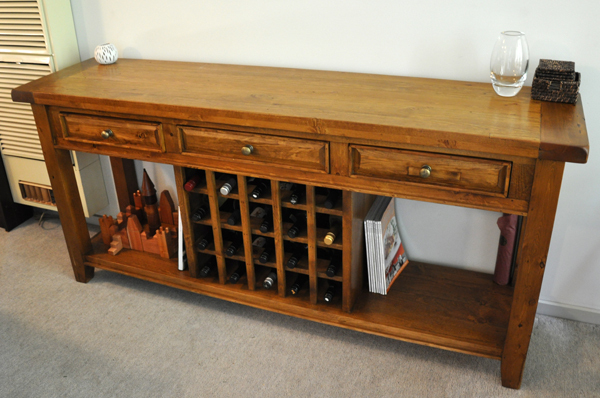 A belated wedding present from Tim S. We were after a wine rack, saw this and got it instead – multi purpose. I swear it looked a much lighter colour in the shop but I think it almost suits better. I might change the handles one day as they are a bit country for me and gold isn’t really my thing, but they aren’t that bad and I think the whole thing is rather lovely. It’s moments like these that make our old semi-broken birch-veneer ‘entertainment unit’ look really crappy. I am in the process of repurposing a pallet to become a coffee table. I bought some supplies this morning, although might need to get my hands on a planer or/and electric sander – it’s very slow going with the good old piece of cork wrapped in the diy stuff. We may also get a piece of glass for free – which will cut back the cost even more. Haven’t worked out if I should stain the pallet… probably not. Hey that “wine rack’ looks awesome! Very excited about the coffee table making too, personally I don’t think you should stain it. Oil or a protective but not too glossy finish would be nice. Chat to Tim, he’s done a few projects over the last few months where what ever kind of varnish has gone over the top has been really subtle and not too shiny allowing the wood to speak on its own. Yeah I’ve already bought a satin water-based varnish so will probably go with that. It might work better to keep the pallet – a pallet. Although I must say the wood is a little sad.